Imagine you have a point, a single little dot on a piece of paper. What’s the quickest way to go from that point to another point on the piece of paper? You (the reader) sigh and answer ”A straight line” because it’s completely obvious; even first graders know that. Now let’s imagine you have an open parking lot, with a human standing in it. What’s the quickest way for the human to get from one side of the parking lot to the other? The answer is again obvious to you, so you get a little annoyed and half-shout ”A straight-line again, duh!”. Okay, okay, enough toss-up questions. Now what if I gave you a car in the parking lot and asked you what was the quickest way for that car to get into a parking spot? Hmm, a little harder now. You can’t say a straight line because what if the car isn’t facing directly towards the parking space? Cars don’t just slide horizontally and then turn in place, so planning for them seems to be a lot more difficult than for a human. But! We can make planning for a car just about as easy as for a human if we consider the car to be a special type of car we’ll call a Dubin’s Car. Interested in knowing how? Then read on! In robotics, we would consider our human from the example above to be a type of holonomic agent. Don’t let this terminology scare you; I’ll explain it all. A holonomic agent can simply be considered an agent who we have full control over. That is, if we treat the human as a point in the x-y plane, we are able to go from any coordinate to any other coordinate always. Humans can turn on a dime, walk straight forward, side-step, walk backwards, etc. They really have full control over their coordinates. A car however, is not holonomic because we don’t have full control over it at all times. Therefore we call a car a type of nonholonomic agent. Cars can only turn about some minimal radius circle, therefore they can’t move straight towards a point just barely to their left or right. As you can imagine, planning paths for nonholonomic agents is much more difficult than for holonomic ones. Let’s simplify our model of our car. How about this: it can only move forwards — never backwards, and it’s always moving at a unit velocity so we don’t have to worry about braking or accelerating. What I just described is known as a Dubin’s car, and planning shortest paths for it is a well studied problem in robotics and control theory. What makes the Dubin’s car attractive is that its shortest paths can be solved exactly using relatively simple geometry, whereas planning for many other dynamical systems requires some pretty high level and complicated matrix operations. The Dubin’s Car only moves forward, never backwards, even if reversal leads to a shorter path. The Dubin’s Car was introduced into the literature by Lester Dubins, a famous mathematician and statistician, in a paper published in 1957. The cars essentially have only 3 controls: “turn left at maximum”, “turn right at maximum”, and “go straight”. All the paths traced out by the Dubin’s car are combinations of these three controls. Let’s name the controls: “turn left at maximum” will be L, “turn right at maximum” will be R, and “go straight” will be S. We can make things even more general: left and right turns both describe curves, so lets group them under a single category that we’ll call C (”curve”). Lester Dubins proved in his paper that there are only 6 combinations of these controls that describe ALL the shortest paths, and they are: RSR, LSL, RSL, LSR, RLR, and LRL. Or using our more general terminology, there’s only two classes: CSC and CCC. Despite being relatively well studied, with all sorts of geometric proofs out there and qualitative statements about what the shortest paths look like, I could not find one single source on the internet that described in depth how to actually compute these shortest paths! So what that we know the car can try to turn left for some amount of time, then move straight, and then move right — I want to know exactly how much I need to turn, and how long I need to turn for. And if you’re like me in the least, you tend to forget some geometry that you learned in high school, so doing these computations isn’t as “trivial” for you like all the other online sources make it out to be. If you’re looking for the actual computations needed to compute these shortest paths, then you’ve come to the right place. The following will be my longest article to-date, and is basically a how-to guide on computing the geometry required for the Dubin’s shortest paths. This blog post was originally written in and then transcribed here to WordPress. If you’d like a more portable, possibly easier to read version, then download the PDF version here (You may also cite this pdf if you’re writing a bibliography). Let’s first talk about the dynamics of our system, and then describe in general terms what the shortest paths look like. Afterwards, I’ll delve into the actual calculations. Car-like robots all have one thing in common — they have a minimum turning radius. Think of this minimum turning radius as a circle next to the car that, try as it might, the robot can only go around the circle’s circumference if it turns as hard as it can. The radius of this circle, is the car’s minimum turning radius. This radius is determined by the physics of the car the maximum angle the tires can deviate from “forward”, and the car’s wheelbase, or the length from the front axle to rear axle. Marco Monster has a really good descriptive article that talks about these car dynamics. Now let’s define how our system evolves over time. If you know even just the basics of differential equations, this will be cake for you. If not, I’ll explain. When we want to describe how our system evolves over time, we use notation like to talk about how our x coordinate changes over time. I’d like to point out that this equation is linear in that the car’s new position is changing to be some straight line away from the previous one. In reality, this is not the case; cars are nonlinear systems. Therefore, the dynamics I described above are merely an approximation of the true system dynamics. Linear systems are much easier to handle, and if we do things right, they can approximate the true dynamics so well that you’d never be able to tell the difference. The dynamics equations translate nicely into update equations. These update equations describe what actually happens each time you want to update the car’s configuration. That is, if you’re stepping through your simulator, at each timestep you’d want to update the car. As the Dubin’s car only has unit velocity, we’ll replace all instances of with . Note that I actually replaced instances of with the symbol . What’s with that? Well, remember when I said that our dynamics are a linear approximation of a nonlinear system? Every time we update, we are moving the car along a line. If we only move a very short amount on this line, then we approximate turns more finely. Think of it this way: You are trying to draw a circle using a series of evenly-spaced points. If you only use 3 points, you get a triangle. If you use 4 you get a square, and 8 you get an octagon. As you add more and more points you get something that more closely resembles the circle. This is the same concept. essentially tells us the amount of spacing between our points. If it is really small, then the points are close together and we get overall motion that looks closer to reality. The CSC trajectories include RSR, LSR, RSL, and LSR — a turn followed by a straight line followed by another turn (Shown in Figure 1). Pick a position and orientation for your start and goal configurations. 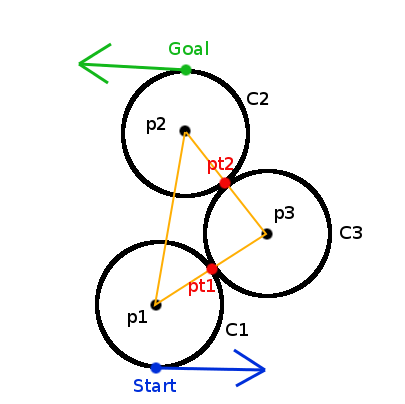 Draw your start and goal configurations as points in the plane with arrows extending out in the direction the car is facing. Next, draw circles to the left and right of the car with radius . 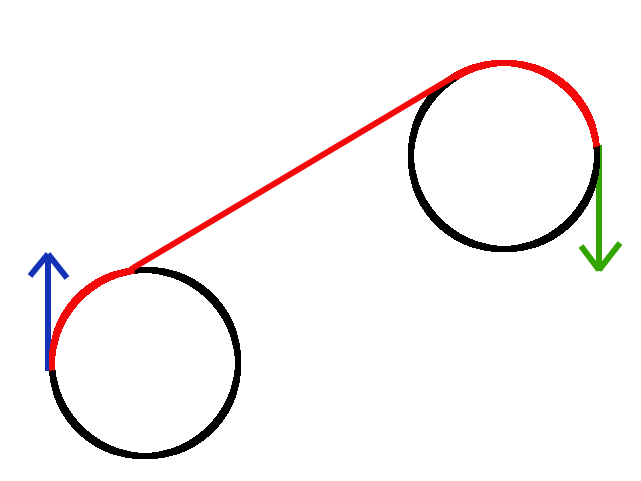 The circles should be tangent at the location of the car. Draw tangent lines from the circles at the starting configuration to the circles at the goal configuration. In the next section I’ll discuss how to compute this, but for now just draw them. 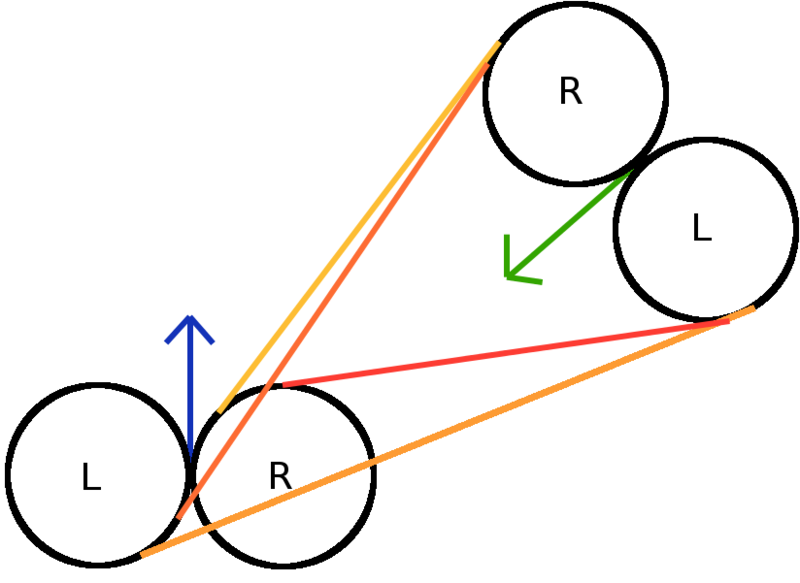 For each pair of circles (RR), (LL), (RL), (LR), there should be four possible tangent lines, but note that there is only one valid line for each pair (Shown in Figure 2. That is, for the RR circles, only one line extending from the agent’s circle meets the goal’s circle such that everything is going in the correct direction. Therefore, for any of the CSC Trajectories, there is a unique tangent line to follow. This tangent line makes up the ‘S’ portion of the trajectory. 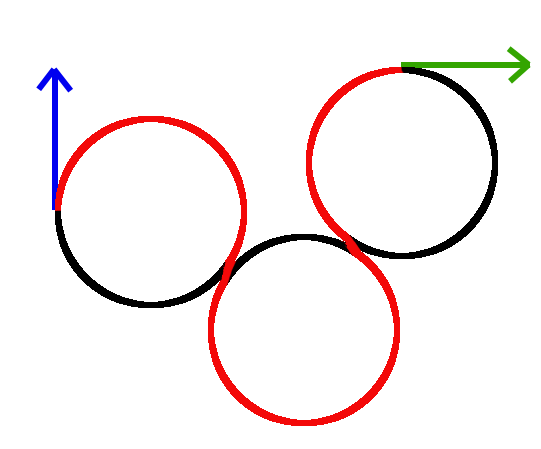 The points at which the line is tangent to the circles are the points the agent must pass through to complete its trajectory. Therefore, solving these trajectories basically boils down to correctly computing these tangents. CCC Trajectories are slightly different. 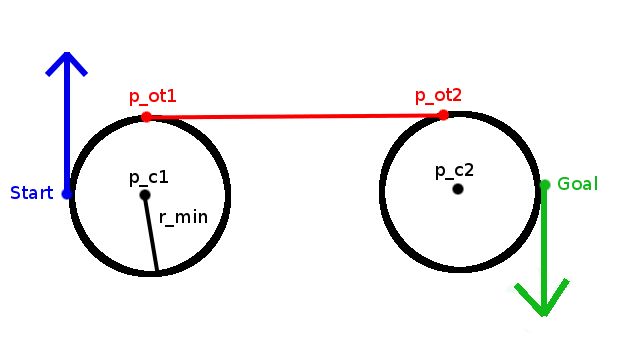 They consist of a turn in one direction followed by a turn in the opposite direction, and then another turn in the original direction, like the RLR Trajectory shown in Figure 3. 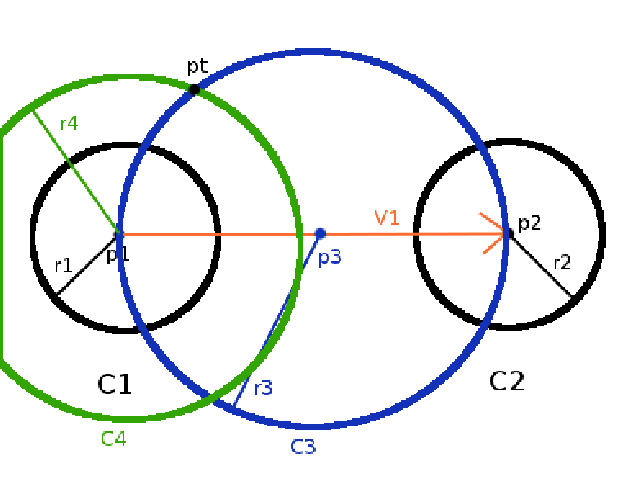 They are only valid when the agent and its goal are relatively close to each other, else one circle would need to have a radius larger than , and if we must do that, then the CCC Trajectory is sub-optimal. 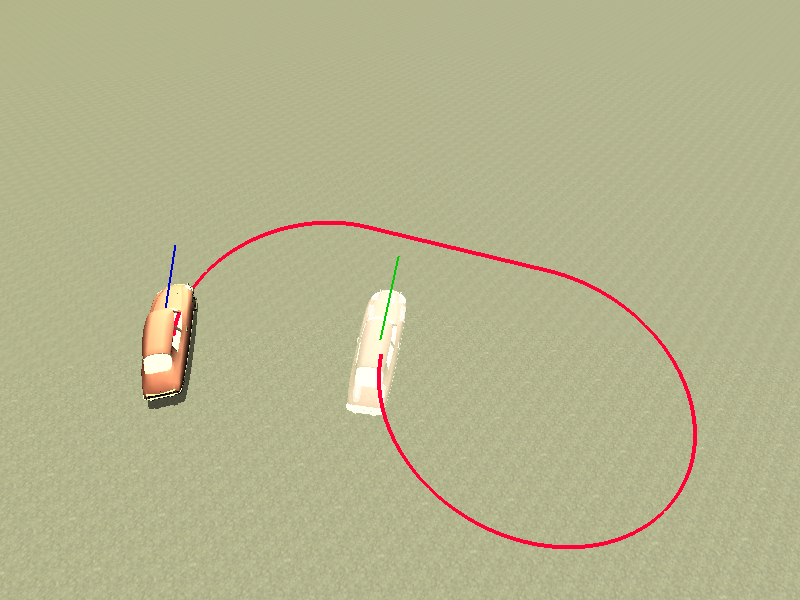 For the Dubin’s Car there are only 2 CCC Trajectories: RLR and LRL. Computing the tangent lines between RR or LL circles won’t help us this time around. The third circle that we turn about is still tangent to the agent and goal turning circles, but these tangent points are not the same as those from tangent line calculations. Therefore, solving these trajectories boils down to correctly computing the location of this third tangent circle. In this section, I will discuss the geometry in constructing tangent lines between two circles. First I’ll discuss how to do so geometrically, and then I’ll show how to do so in a more efficient, vector-based manner. 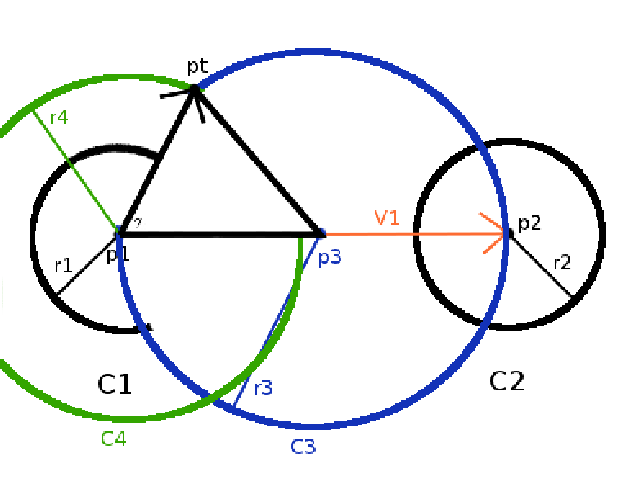 Given: two circles and , with radii and respectively. Consider the center of as , the center of as , and so on. (Figure 4). Figure 4. Setup for computing tangents. Figure 5. Steps 1 and 2. 4. Construct a vector from to the “top” point, of intersection between and . If we can compute this vector, then we can get the first tangent point because is pointing at it in addition to . For visual reference, see Figure 7. It may be a bit of an abuse of notation to add a vector to a point, but when we add the components of the point to the components of the vector, we get our new point and everything works out. I hope this is clear enough for you to be able to compute the other inner tangent point. The trick is to use the “bottom” intersection point between and , and then work everything out exactly the same to get and , which define the other inner tangent line. Constructing outer tangents is very similar to constructing the inner tangents. Given the same two circles and as before, and assuming Remember how we started off by making centered at with radius ? Well this time around we’ll construct it a bit differently. is centered at as before, but this time it has radius . This is exactly the same as before. In essence, the only step that changes between calculating outer tangents as opposed to inner tangents is how is constructed; all other steps remains exactly the same. Now that we understand geometrically how to get tangent lines between two circles, I’ll show you a more efficient way to do so using vectors that has no need for constructing circles or . We didn’t work through the example in the previous section for nothing– we had to work up to Step 7 so that you could have some intuition on why the following vector method works. 1. 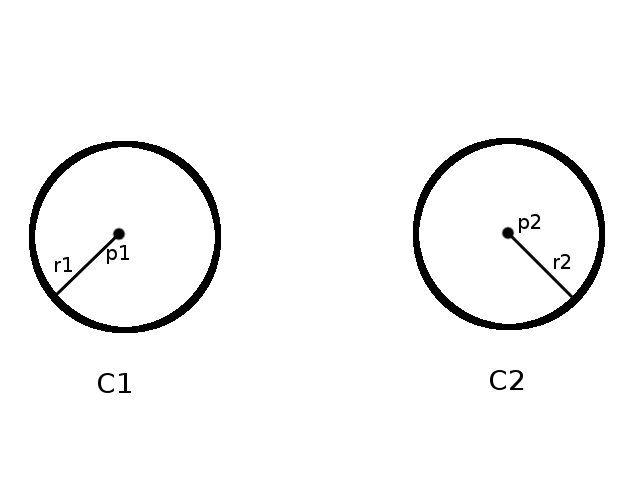 Draw your circles and as before (Figure 4). 2. Draw vector from to . This has magnitude as before. 4. Draw a unit vector perpendicular to . We’ll call it (normal vector). Figure 10 depicts our setup. In the general case, the radii of and will not be equivalent, but for us it will. This method works for both cases. 5. Let’s consider some relationships between these vectors. • The dot product between and is 0 because the vectors are perpendicular. • because is a unit vector. Refer to Figure 10: Setup for computing tangents via the vector method. respective tangents; we need to move a distance of to get to the first tangent point. Likewise we need to translate (the center of the other circle) ”down” the same amount of distance. I’ll refer to the normalized Simply as from here on. is the cosine of the angle between and . Because it’s constant, and I don’t want to keep re-typing it, let’s define (constant). • All that remains now is to rotate through the angle , and it will be equivalent to . Rotating a vector is a well known operation in mathematics. 6. Knowing as well as (remember when we modified to be to ? ), allows us to very easily calculate the tangent points by first going from the center of along n for a distance of , and then from there following to get the second tangent point. we did with Method 1. Refer to freely available code online for how to actually implement the vector method. points on the circle. Fortunately there is a simple fix. Given: A circle centered at with points and along its circumference, radius , and circle directionality , which can be “left” or “right”. after you compute the Euclidean distance between the points. I say naively because this method will only give you the shorter arc length, which will not always be correct for your directed circles (Figure 11). Figure 11. A scenario where the arc length on a directed circle is actually the larger of the two between the points. A better strategy would be to generate vectors from the center of the circle to the points along the circumference. That is, and . Let’s assume that the arc you want to traverse is from to with direction . We can use the function to compute the small angle between the points as before, but the difference is that gives us directional information. That is, will be positive or negative depending on what direction rotated to end up at . A positive rotation is a “left” turn and a negative rotation is a “right” turn. We can check the sign of this angle against . If our angle’s sign disagrees with the direction we’d like to turn, we’ll correct it by either adding or subtracting 2 . With a function like this to compute your arc lengths, you will now very easily be able to compute the duration of time to apply your “turn left” or “turn right” controls within a circle. RSR, LSL, RSL, and LSR trajectories are all calculated similarly to each other, so I’ll only describe the RSR trajectory (Figure 12). Given starting configuration and goal configuration , we wish to compute a trajectory that consists of first turning right (negative) at a minimum turning radius, driving straight, and then turning right (negative) again at minimum turning radius until the goal configuration is reached. Assume that the minimum turning radius is . Now that we’ve obtained the circles about which the agent will turn, we need to find the outer tangent points we can traverse. I demonstrated earlier how one would go about calculating all the tangent points given two circles. 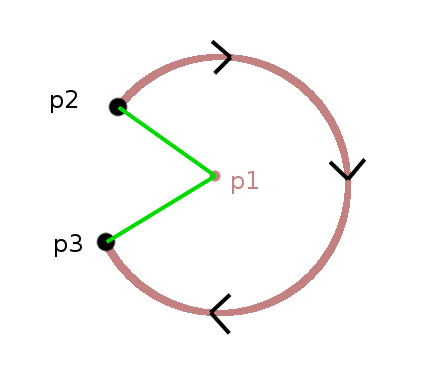 For an RR circle, though, only one set of outer tangents is valid. If you implement your tangent-pt computing function appropriately, it will always return tangent points in a reliable manner. At this point, I’ll assume you are able to obtain the proper tangent points for a right-circle to right-circle connection. Your tangent point function should return points and which respectively define the appropriate tangent points on , the agent’s right-turn circle and , the query configurations’ right-turn circle. Now that we’ve calculated geometrically the points we need to travel through, we need to transform them into a control the agent can understand. Such a control should be in the form of “do this action at this timestep”. For the Dubin’s car, this is pretty easy. If we define a control as a pair of (steering angle, timesteps), then we can define a RSR trajectory as an array of 3 controls: ( , ), ( , ), and ( , ). We still need to compute the number of timesteps, but this isn’t so bad. Computing the other trajectories now becomes a matter or getting the right tangent points to plan towards. The RSR and LSL trajectories will use outer tangents while the RSL and LSR trajectories use the inner tangents. Two of the Dubin’s shortest paths don’t use the tangent lines at all. These are the RLR and LRL trajectories, which consist of three tangential, minimum radius turning circles. Very often, these trajectories aren’t even valid because of the small proximity that and must be to each other for such an arrangement of the three circles to be possible. If the distance between the agent and query configurations’ turning circles is less than , then a CCC curve is valid. I say less than , because if the distance were equal, then a CSC trajectory is more optimal. 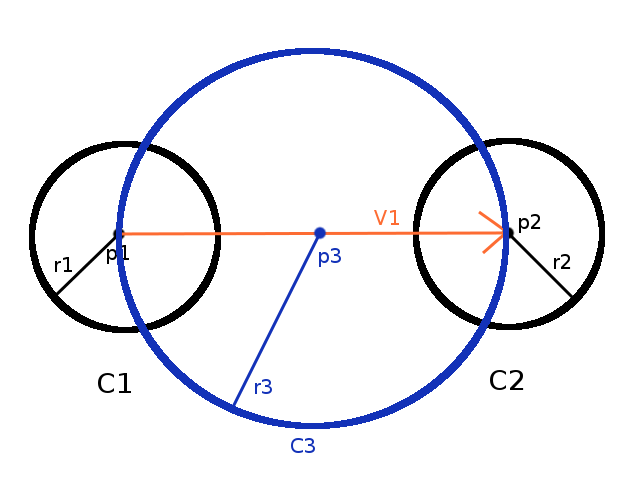 For CCC trajectories, we must calculate the location of the third circle, as well as its tangent points to the circles near s and g. To be more concrete, I’ll address the LRL case, shown in Figure 13. Consider the minimum-radius turning circle to the “left” of to be and the minimum-radius turning circle to the “left” of to be to . Our task is now to compute , a minimum-radius turning circle tangent to both and plus the points and which are respective points of intersection between and , and between and . Let be the centers of and , respectively. We can form the triangle using these points. Because is tangent to both and , we already know the lengths of all three sides. Computing the tangent points and becomes easy; we can define vectors from the to and , and walk down them a distance of . As an example, I’ll calculate . First, obtain the vector from to ; . Next, change the vector’s magnitude to by normalizing it and multiplying by (or just dividing its components by 2, as its magnitude should already be ). Computing follows a similar procedure. At this point we have everything we need for our CCC trajectory! We have three arcs as before, from to . From to , and from to . One can compute arc lengths and durations as before to finish things off. So now that we’ve computed all of the shortest paths for the Dubin’s Car, what can we do next? Well, you could use them to write a car simulator. The paths are very quick to compute, but are what’s known as ”open-loop” trajectories. An open-loop trajectory is only valid if you apply the desired controls exactly as stated – so a computer. Even if you used a computer to control your car, this would still only work perfectly in simulation. In the real-world we have all kinds of sources for error, that we represent as uncertainty in our controls. If a human driver tried to apply our Dubin’s shortest path controls, they wouldn’t end up exactly on target, would they? Perhaps in a later article I will discuss motion planning under uncertainty, but for now I defer you to the internet. Another application we could use these shortest path calculations for would be something known as a rapidly exploring random tree, or RRT. An RRT uses the know-how of planning between two points to find reachable points in an environment that has obstacles. The resulting structure of points that are connected is a tree with a root at our start, and the paths one gets from the tree can look pretty good; imagine a car deftly maneuvering around things in its way. RRTs are a big topic of research right now, and Steven LaValle has a wealth of information about them. Following from the Dubin’s RRT idea, you might one day use a much more complicated car-like robot. For this complicated car-like robot you may want to also use an RRT. Remember when I said that the resulting structure of an RRT looks like a tree with its root at our start? Well, to ”grow” this tree, one has to continue adding points to it, and part of that process is determining which point in the tree to connect to. Typically this is done by just choosing the closest point in the tree. ”Closest” usually means, ”the shortest line between myself and any point in the tree”. For a lot of robots (holonomic especially), this straight-line distance is just fine, but for car-like (nonholonomic) robots it may not be good enough, because you can’t always move on a straight line between start and goal. Therefore, you could use the length of the Dubin’s shortest path instead of the straight-line shortest path as your measure of distance! (We’re using the Dubin’s shortest paths as a ”distance metric”). In reality, the Dubin’s shortest paths are not a true distance metric because they are not ”symmetric”, which means that the distance from A to B isn’t always the same as the distance from B to A. Because the Dubin’s car can only move forward, it isn’t symmetric. However, if you expanded the Dubin’s car to be able to move backwards, you’d have created a Reeds-Shepp car, and the Reeds-Shepp shortest paths are symmetric. I’d like to thank my colleague Jory Denny for LaTeX sorcery and various grammar edits. Do you have a MATLAB version of this code? Also, I would be interested in keeping a log of the paths generated in terms of acceleration and angular velocity. About acceleration and angular velocity: the Dubins car does not accelerate, it only travels forward at a unit velocity. You could simulate acceleration by playing with the number of timesteps to integrate at a time, but the path wouldn’t change appropriately; you’d only be faking it. Thanks Andy, I will see if I can have a MATLAB version of this. Actually, I want to simulate/generate trajectories with focus on two inputs only, i.e., acceleration of car and angular velocity of steering wheel (or car ?). So that, e.g. for a left turn, the car decelerates as it approaches intersection, followed by anticlockwise motion of steering (and thus the car drifting towards left) followed by acceleration. Would you recommend an algorithm? Hi Piet, glad you enjoyed the article! I do not know of any MATLAB implementation at this time. Feel free to make one, and I’d be glad to link to it! Hello. 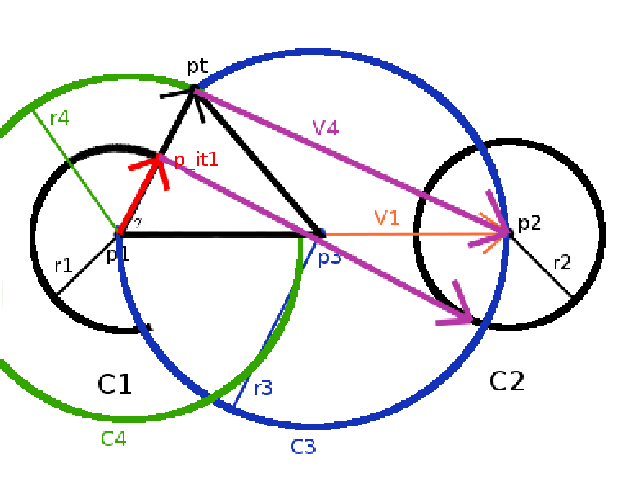 It is not clear to me how do you find the inner tangents in the second method, where you modify the vector V1, if r1 and r2 are equal (minimum turn rate is equal across the whole trajectory), it will always come out as parallel to the vector between the circle centers. Thanks for the reply. That’s a perceptive question. You’ve noticed that if we subtract the radii, and they’re equal, then the normal is scaled by 0 and we can’t rotate V1 at all! However, I’ll note that equation is specifically for computing outer tangents. 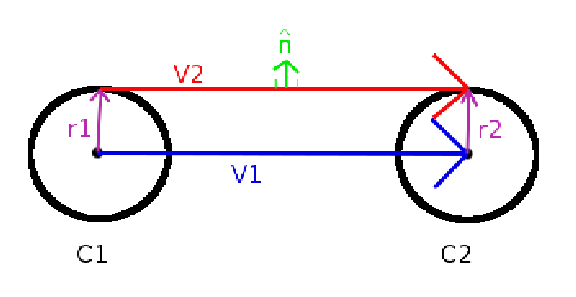 Think of it this way: When we want to rotate V1 to be the same as V2 for outer tangents, then we need to move the right endpoint “up” (or down) by a little bit. If the radii are the same, then not at all, but if r2 is slightly larger than r1, we want to move by that difference, which is just a little bit. For inner tangents the situation is quite different. Essentially we need to perform addition instead of subtraction. Here’s a way to think about it; if we shrank C1 to a point, and then grew C2 by a proportionate amount, how far would we need to move the endpoint “up” to reach the circle’s perimeter? r1 + r2! (We just did something called a Minkowski sum for circles). I’m sorry, but I do not have such a paper. I think you mean “shortest path”? If you model your done as only moving in a plane, then this work is applicable, however you probably want a more complex path planner. Hey , thank you for this article. In the method two of construction of tangent lines , how would we find the tangent points for inner tangents without drawing C3 and C4 ?